Philadelphia, PA (June 29, 2010) – As corporate America becomes more committed to sustainability and green practices, the benefits of implementing a sustainability program appear in many areas of their businesses. 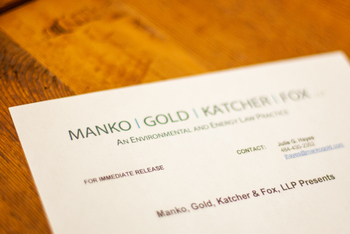 On Wednesday, July 7 at 11 a.m., John S. Kirk, a Certified Legal Manager and Director of Administration at Manko, Gold, Katcher & Fox, LLP (MGKF), will explain how sustainability programs can make financial sense for businesses. His presentation, "Making 'Cents' of Going Green," will a live, interactive 60-minute conference presented by the Association for Accounting Administration (AAA) Individuals can participate either over the phone or through an internet connection.